The course will be open at the following times: Obviously subject to weather. THURS 10 AM – 7PM. Access and parking is via the event entrance. The gate must be kept shut at all times. cost £30 per horse to includes booking fee of £1.35 per entry. The X.C. Course covers an area of 55 acres with a number of obstacles. The course ranges from BE80 standard to Novice. The water complex and main schooling area are in flat fields – but we do have sloping fields into the valley running through the farm which are great for getting horses fit. We are available for pony club rallies and group bookings, and can provide qualified instructors if required. 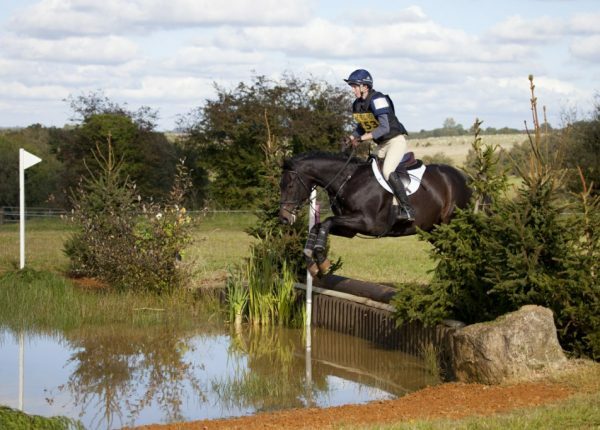 Calmsden XC is not used as a schooling venue and is only used for competition use. The following declaration must be signed by all riders and/ or parents of children using the cross country course for schooling. I will be wearing suitable footwear with defined heels, a back protector and a hat conforming to the current British quality standards as defined in the 2019 BE rule book. I will only jump the flagged and numbered obstacles. Any steps NOT flagged are not to be jumped; this includes the step into the water. I understand that riding cross country is a risk and I have taken all reasonable steps to ensure that my horse is capable of jumping these obstacles and I have the relevant level of experience to attempt them. I have a working mobile phone. Or a non-riding adult has a mobile phone. I take full responsibility for any non – riding spectators. No rider under 10 is permitted. Jo Verey mobile phone: 07737256816. Chris Verey 07740851221. The nearest A&E is Cirencester BUT DOES NOT OPERATE AFTER 5PM. Swindon or Cheltenham are approx. 15 miles away.